All transactions are safe and secure with a reliable history in online purchasing behind each of our associates. Buy the TapouT Hoodies to own UFC clothing and merchandise. 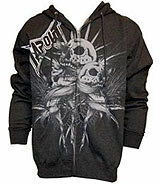 Submit to a stylish Tapout hoodie that features the clothing company's logo. The item on the left features grey skulls on the front. A regular or zip-up sweatshirt is great for both MMA fight fans and participants. Wear it overtop of your favorite UFC shirt. Official Tapout apparel is available in several product lines. The company's influence runs deep among fans, with some going as far as to tattoo the company's logo onto their bodies. In addition to the TapouT Hoodies above, browse the UFC Clothing Gallery for more apparel like men's and women's clothes, kids shirts or hoodies.